Making your own emoji is hard if you have to start from complete scratch, but fortunately, emoji-making apps are designed to make creating emoji easy. 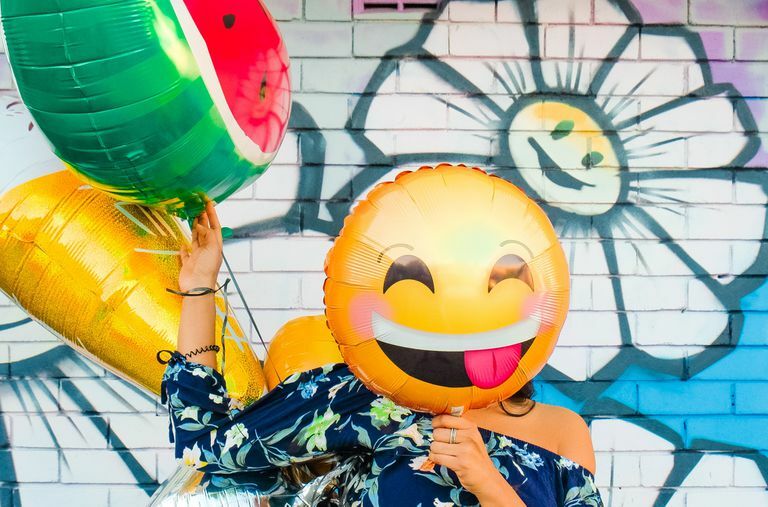 You can make your very own personalized versions of those smiley-face pictures and then send them anywhere, like over Facebook Messenger, WhatsApp, email, text, and others. Some emoji makers are designed to make an emoji that looks like you, and others are for making fun emoji that don't really look like anyone you know. Either way, you're bound to find an emoji maker that works for you. One of the easiest ways to build a custom emoji is to do it online. All you need to do is visit the emoji builder website, decide how you want your emoji to look, and then save the emoji as an image file. No software or app download is required. Click any of the emoji bodies to pick the frame for your emoji. You can choose from women, men, children, spheres, shapes, aliens, and more. Click the stickers button at the top of the page to select facial features like eyes, a mouth, ears, and so on. You can also add accessories like glasses, sparkles, flowers, hats, and more. After adding an item to your emoji's face or body, you can adjust the size and position by dragging and dropping the objects anywhere you like. To add text, click the text button at the top of the page, select a text bubble, and type the text you want to include in your emoji. A cut-out tool and a paintbrush tool are the other two options you can use to customize your emoji. The first lets you import a second image onto your emoji for a really personalized look, and the brush can be used to freehand draw anything you want. Click Save when you're done to save the emoji to your computer as a PNG image. The Share button lets you share the emoji over Facebook, email, Tumblr, and other sites, as well as copy a link to the emoji or save it to Dropbox, Google Drive, and other cloud storage sites. Another free emoji maker website is Disney Emoji Maker which is easy for all ages to use and lets you save your emoji to your computer or share it over Twitter or Facebook. Some other ways to make emoji online are with Angel Emoji Maker, Emotiyou, and Emojibuilder. If you have Windows 10 or a Windows mobile device, you can also make your own emoji with the Moji Maker desktop program. Choose from thousands of designs for your personalized emoji, and when you're done building one, you can save it and share it with others directly from the app. If you plan to your use your emoji from your phone or tablet, an emoji maker app is what you want to use. Bitmoji. You can't go wrong making a custom emoji with Bitmoji. The app (for iPhone and Android) is a lot of fun to use and has tons of options, and when you're done, sharing it through your other apps couldn't be easier when you use the Bitmoji keyboard. Using Bitmoji is easier than other similar emoji creators because you can log in with Snapchat, which a lot of people already use anyway. Plus, you can take a selfie and compare it with your emoji to make the most realistic looking emoji clone of yourself — all sorts of elements are available to truly customize your emoji, like choosing a head and eye shape, skin tone, and hair style. Emoji Me Animated Faces. iPhone and iPad users can also make custom emoji with Emoji Me Animated Faces. With this emoji builder, your emoji moves automatically like a GIF, which is much more fun than an emoji that just sits there when you send it to someone. To start making your own emoji with Emoji Me, just choose a female or male face and then customize it to your liking. You can change your face shape and skin color, hair style, eye/lip/nose/ear shape and color, and more — there are over one trillion combinations you can make, so you can bet that yours could be truly unique. When you're done, your emoji is automatically available in many different versions like one that's waving, saying "thank you," laughing, and more — you can pay for others if you want. Once you've chosen an emoji you like, share it over your messaging apps.